What ideas and thoughts come to mind when you think of nature, especially as it relates to persons who are blind and how they interact with it? Perhaps you’ve had experiences as I have where people with typical vision talked about how much they wished I could see one or more aspects of nature or some outdoor phenomenon that seemed only to be understood by people with typical eyesight. While people with blindness and low vision may not experience the outdoors in the same way as people with typical vision, they can enjoy it, learn about it, and experience it in their own unique way. This post highlights a new website, http://www.naturefortheblind.com/, dedicated to enhancing the understanding and interaction with nature and the outdoors by people who are blind and visually impaired. We will discuss the site’s founder and his inspiration for creating it, the information the site provides, and how you may add to its content. The Nature for the Blind website strives to connect people who are blind and visually impaired with opportunities for exploring nature and participating in outdoor recreational activities. Always interested in nature, the site’s creator, Evan Barnard, started working with the visually impaired community at age 12 in 2010 when he helped clear pathways and replace stolen Braille signs along a vandalized Braille trail in the Nature Conservancy-owned Marshall Forest in Rome, Georgia. Barnard collaborated with the local Rome-Floyd County chapter of the Georgia Council of the Blind and began advocating for increasing their access to natural areas. Barnard eventually designed and built another Braille nature trail, the Whispering Woods Braille Trail, to give more people with visual impairments access to the outdoors. The trail was designed with input from members of the Georgia Council of the Blind and built by student and adult volunteers with grants and corporate donations. The finalized Braille trail was officially dedicated with a nature walk for Georgia Council of the Blind members in 2014. Barnard began coordinating local nature walks and programs along the new Braille trail for youth and adults with visual impairments and blindness, creating the organization Nature for All to bring student volunteers together with youth who are visually impaired or blind to share nature experiences. While Barnard researched the creation of a new Braille trail at the Georgia Lions Camp for the Blind, he discovered that Braille trails and sensory gardens existed in other cities across the United States and around the world. He also determined that no one had compiled a directory that provided an opportunity for people who are blind and visually impaired to locate these mostly unpublicized trails and gardens. As a result, Barnard surmised that many people with low vision or no vision did not know that these opportunities existed, even when the trails and gardens were a part of someone’s own community, and he decided to change that situation by creating the Nature for the Blind website. 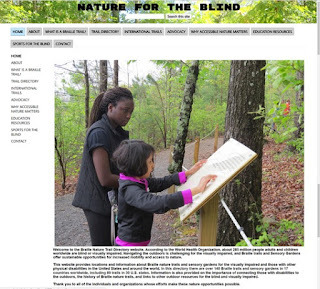 Barnard’s site, Nature for the Blind,provides locations and information about Braille nature trails and sensory gardens for members of the visually impaired community as well as people with other disabilities in the United States and around the world. It lists detailed information on 165 Braille trails and sensory gardens found in 28 countries worldwide, including 93 trails in 31 different U.S. states and Puerto Rico. These trails and gardens are incredibly diverse in terms of location, natural features, trail design, and opportunities for interaction. States like California and Massachusetts have as many as nine different Braille trails and sensory gardens, and, internationally, South Africa has 14 Braille trails, most at national parks. There are special tours available for people who are blind and visually impaired to travel to multiple national parks around South Africa and experience the different Braille trail locations with others. Some Braille trails have themes, such as a trail in Tennessee based on the book series The Chronicles of Narnia and a discovery Braille trail in South Africa based on fossils. What are Braille Trails and Sensory Gardens? A Braille Trail is a nature trail with Braille informational signage and physical aides that allow people with no or limited vision to experience the trail without assistance. These trails usually include a guide rope or rails to hold. The ropes or rails usually follow along a guide dog friendly path with Braille informational signage about the natural surroundings. The trails often include stations for experiencing physical trail features placed at key points along the guide rope. Some trails have tactile walkways to provide direction while others have audio components such as guided audio tours or smartphone access. Many have features making them wheelchair-accessible. A sensory garden is designed to provide tactile experiences through the usage of specific plants in a specially designed layout to create opportunities and accommodations for people with varying disabilities to enjoy the touch, sounds and scents of the outdoors. Sensory gardens utilize aromatic and textural plants, and often have Braille informational signage, guide ropes or rails, audio features, and tactile pathways for people who are blind and visually impaired to walk along them without assistance. Many sensory gardens also have wheelchair-accessible walkways and raised garden beds. The Nature for the Blind website also provides information on the history of Braille trails, the importance of connecting individuals with disabilities to the outdoors, links to outdoor and travel resources for the blind and visually impaired community, and other educational opportunities and programs. 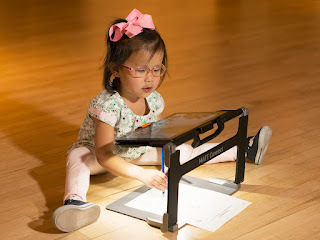 Educational resources on the website include links to schools for the visually impaired around the world, as well as summer camps, education programs and other informational links. Contacts for outdoor sports for people with blindness and low vision highlighted on the site include golf, horseback riding, beep baseball, bowling, and others, such as snow skiing and wind surfing for people who are blind. Additional Braille trails and sensory gardens are under construction and will be added to the website directory when their construction is complete. Barnard hopes to expand the website to provide additional resources and opportunities for youth and adults who are blind and visually impaired to connect through common interests and share outdoor opportunities in their communities with others. Therefore, the site likely will be updated regularly, highlighting these new trails, gardens, and educational activities. Barnard desires for the site to grow and feature as much information as possible. For this reason, website visitors from around the world are encouraged to share information and photos of local Braille trails, sensory gardens, and other outdoor opportunities and events for people who are blind in their communities with Nature for All. Please send any submissions via email to communications@nature4all.org for inclusion on the Nature for the Blind website. Your photos and other information may also appear on their Facebook page at https://www.facebook.com/naturefortheblind/. If you have any questions or desire additional information on Nature for All or the new Nature for the Blind website, please contact communications@nature4all.org.